Trackglaze Vertical is a DIY sliding insulation system, effective against heat loss, noise intrusion and draughts. It uses adhesive double tracks, a single pane in each channel, which when closed form a seal on all 4 sides plus across the join where the panes meet. This is achieved by using bristle seal on the sheet edges and in the tracks, handles that clip onto the top and bottom of both panes and special push-fit Stop Strips, that fix onto the track edges to prop the panes open or raised, or fix them in position when closed. The system is designed for 4mm Polycarbonate glazing sheet, as this is stronger than acrylic, and should never be used with glass. The simple design allows the two panes to meet at whatever height you choose, so you can align with the outer window. This is particularly useful for sash windows, allowing access to the centre locking mechanism before opening either top or bottom pane for ventilation. 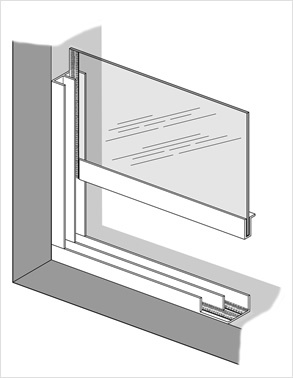 When Trackglaze Vertical is closed, the top pane is propped shut with Stop Strips, to prevent falling or any movement that breaks the thermal seal and therefore the insulation provided. 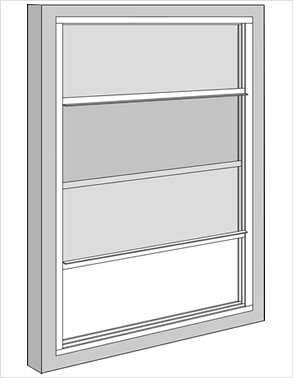 By removing the Strips, the pane can now be lowered to and propped at the desired height until it is closed. With handles on both panes, the bottom pane can also be moved and propped open, giving access to any part of the outer window. There are limitations of the system, although these can be overcome. As there are no mechanisms, weights or brakes (other than the friction of the bristles within the tracks), a large pane, if not supported when in use or propped when not, can fall under its own weight. For a household where, for example, young or mischievous children might be at risk, we have other Easyfix systems for insulating any window. The other potential issue is that Trackglaze Vertical requires a cavity in which to be fitted, as this naturally supports the weight and movement of the panes. Of course, most sash windows do not have a suitable cavity but this can be made by fixing wooden battens on the surround, or with the use of Window Conversion Angles, that are strong 25mm Angles that can be fixed to create the cavity. 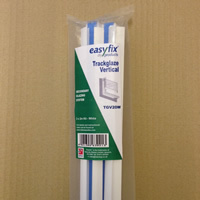 These are available in small or bulk packs, white or brown to match the kits. Product details are in the table below and more information on the angles is in the PDF alongside the videos. If you want a side to side sliding system, see our Trackglaze Horizontal details. The Double Tracks are 19mm wide, but the handles will protrude about 6mm beyond this, which needs to be taken into account for the depth of cavity required.